Out of all of the components on your automated garage door at home, the springs are some of the most important. They work hard to keep your door secured in position, well balanced, and to ensure that it can be used safely on a continual basis. Unfortunately, they do sustain damages from time to time, either as the result of weather exposure and time or from accidents. Whatever the cause, when your garage door springs start showing signs of failure, it is best to have them replaced or repaired as soon as possible. Our team at Garage Door Repair South Jordan is here to do just that. Our team works with a wide selection of different types of springs, each well suited for specific doors and environments. We provide torsion coil, galvanized, tempered, overhead and extension garage door springs, to name a few and install them with exceptional care and accuracy. 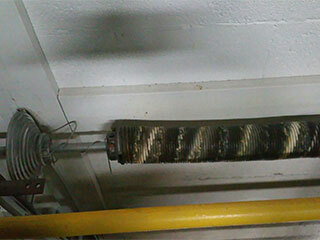 Springs get damaged over time through regular operation, which can undermine their effectiveness and safety. Stress marks, warping, and cracks could pose more danger to your doors than you would expect, which is why we endeavor to repair troublesome or broken garage door springs wherever possible and to replace those that are too far gone. Through careful maintenance, we can ensure that your garage door springs last longer and work better. Call us now to have one of our technicians inspect and service your springs on a regular basis, to ensure that your doors are being used safely. For further details on our various services, browse our website or leave us a message online with any question or concern!